This corset is believed to date in the 1930's period, however it may date a little earlier, or later than that. 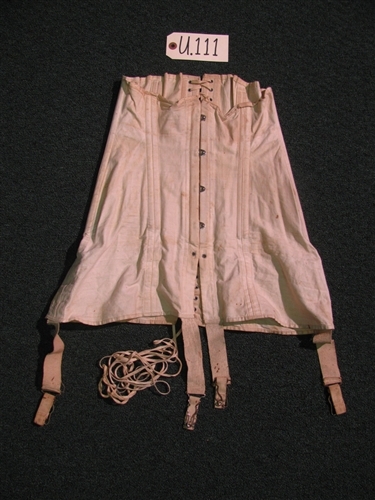 This woman's corset is of the off white color, that is now aged to an almost light yellow color. This corset is of the classic, back laced design with frontal metal closure hooks. It is heavily boned throughout. The material that it is constructed out of is very light weight suggesting that this corset was intended for warm or summer wear. There are 4 adjustable garters at the bottom. They are of the proper style for a earlier made garment of the 1930's period and not of the more common 1940's much simplified type. 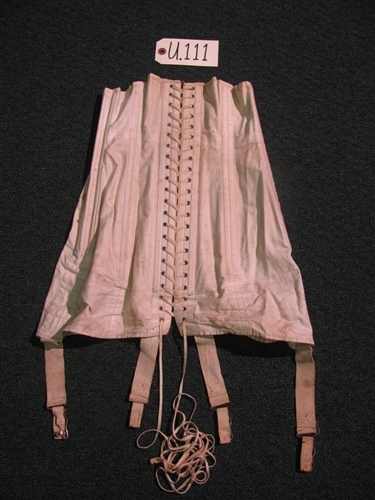 The condition of this corset is consercatively rated in a FAIR CONDITION. It has much age yellowing, and the usual gamut of snags, stains, small tears, lose threads, etc. However, this corset is still overall quite a presentable piece and should rate of a higher quality rating than listed above. On the inside of this corset can be found this imprinting: "Warner's, No. B-292, Cotton Corset, Made In America, Reg. U.S. Pat. Off., Bones With Rust Proof, Every Pair Guaranteed". As with all of the museum's garments that are being made available, none are being sold to wear as they are all considered as historical antique garments. Antique corsets are quite rare to find today. This is primarily because by the 1940's period not many women still wore them for daily use. Also, when they were worn, they were worn until they were no longer intact from hard usage and had to be discarded. We have collected vintage corsets, stockings, and high heels for over 38 years, and have a fairly good idea as what to expect when inspecting such rare vintage specimens. 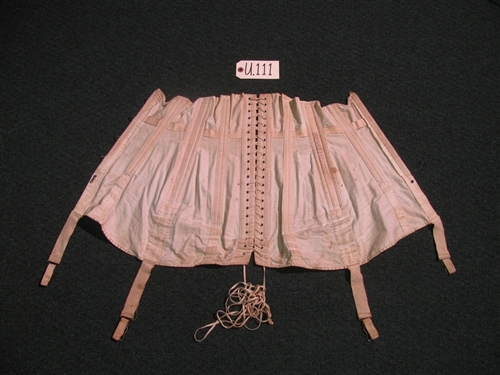 We have endeavored to describe this corset as accurate as is possible, however the final determination on any of the facts remains that of the future buyer. The corset is not of the more common "girdle" style. It has little in the way of fine detailing that suggests that it was for utilitarian or daily use, and additionally not of great expense. It would make a perfect undergarment for any working girl's mannequin ensemble. Priced right for the collector.